Definition of Totem Poles: What are totem poles and what are the meanings of Totem Poles? Native American Totem Poles or posts are sculptures carved into large tress by cultures of the indigenous peoples of the Pacific Northwest Coast of North America. Totem poles are carved and painted with symbols and totems or figures such as animals, that represent the emblems of clans or families and relates to their belief in Totemism. A totem is an emblem, such as an animal or plant, that is believed to have spiritual significance and watches over the family, clan, or tribe symbolizing their guardian spirit or helper refer to Totem Pole Art and Design. The word totem is derived from the Ojibwe (Chippewa) word 'odoodem' meaning "his kinship group". Totem Poles were not worshipped but they inspired respect. Who made the Totem Poles? In the culture of the Northwest people Totem Poles were erected in the front of a Northwest Native Indian's home and would show the ancestry and the social rank of the family. The figures carved on the Totem poles could be humans, animals, or other creatures. Totem poles a sign of affluence, a display of wealth. They were expensive and time consuming to construct requiring significant manpower in their construction and erection, which is why they are generally found near the houses of Native American chiefs. A totem pole in front of a Native Indian's home would show the ancestry and the social rank of the family. They validated the powerful rights and privileges that the family held. The locations of totem poles vary. Some stand in front of the houses, or very near them; others posts are set near the waterfront or beach, beyond the village. For additional, interesting info refer to How to make a Totem Pole. Totem Poles are created using Pictography, or writing with pictures and symbols. Totem poles have unique features and colors depending upon the clan or tribe. Their interpretation requires knowledge of the customs, traditions and history of the clan or family. Every color used on the Poles have meanings as do the figures carved on the Totem Poles. 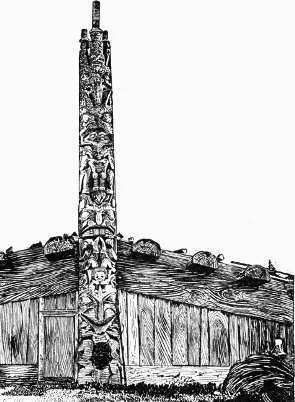 The Symbols for every animal or spirit carved on the pole also have meaning and when combined on the pole, in sequence, constitute a story, legend or myth. The meaning of Totem Poles can be interpreted from the carvings and symbols that tell a story. As totem poles become old they decay and become weather-beaten and gray in color. Groups of old poles are sometimes compared to a forest of tree trunks left after a fire has swept through a wooded district. Creating Totem Poles - How long did it take? The length of time taken to carve and paint the poles clearly depended on the size of the pole and the intricacy of the carving. Generally totem poles could take between 3 and 9 months to complete and required the skills of the experienced carver and his helpers.